This summer I have been looking at a lot of books, buying them and checking them out at the library. I decided that perhaps some reviews were in order. I look for books that might give me inspiration, teach me a new skill, guide me through a project idea or lead my artwork in a new direction. I also browse books that might aid me in my classroom instruction, or ones that might provide students with ideas and inspirations for their own classroom projects. Here I will attempt to share the ones I like and didn’t like, and would love your feedback! I love books with lots of pictures. I am a visual learner (as many artists are) so I like to see things step-by-step whenever possible. If there is too much text I will be completely turned-off and quickly dismiss the book or blog. 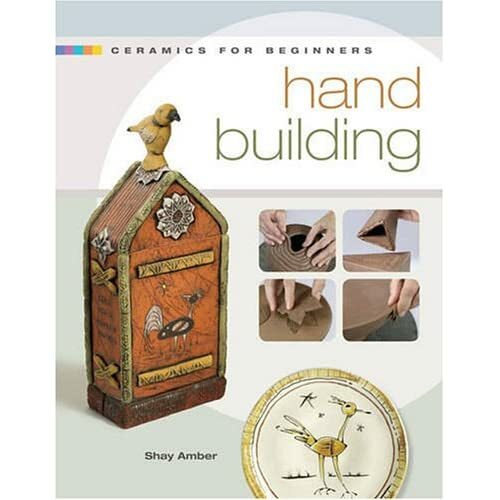 I saw this book and thought it might be perfect for my students when working with clay. Time will tell if it is a good book for the classroom, but I am totally inspired to get back to the classroom and make something. It is an all inclusive book giving details about all the tools, materials and equipment necessary for doing basic hand built projects. You will probably skip over a lot of the pages, like I did, if you have already spent time creating in a clay studio. This entry was posted in Book Reviews, Pastimes and tagged book, Book Reviews, books, ceramics, clay, hand building on July 10, 2010 by Sheba.